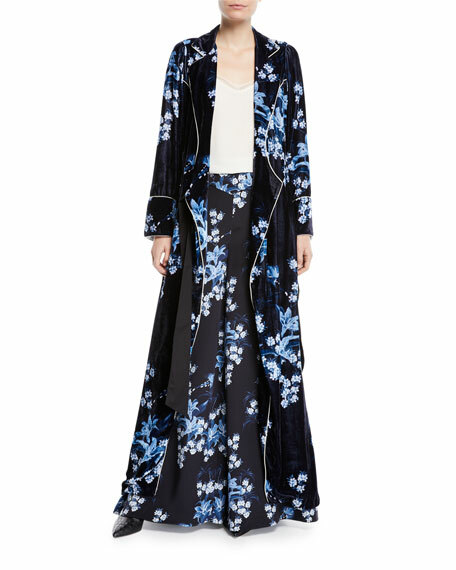 Johanna Ortiz "New Sunrise" floral-print velvet kimono coat with piping. After graduating with Honors from the Art Institute of Fort Lauderdale in 2002, Johanna Ortiz returned to her native Colombia to launch her eponymous label. What began as a swimwear brand soon evolved into a complete ready-to-wear line, known for its festive and vibrant designs. Her signature pieces, from menswear-inspired shirting to elaborate evening gowns, are characterized by a balance between delicate femininity and sensual masculinity.